Aleisha holds a PhD in music from the University of Auckland, and also writes about jazz for New Zealand Musician, audioculture.co.nz (one of the directors is Simon Grigg who I interview in this month’s North & South magazine), her blogs nzjazz.wordpress.com and jazzhistorianafterhours.wordpress.com, and on Twitter as @nzjazzhistory. This is the reaction I get every time I explain my PhD topic: Jazz in New Zealand 1920-1955. I’ve even had that reaction from jazz musicians and fans. 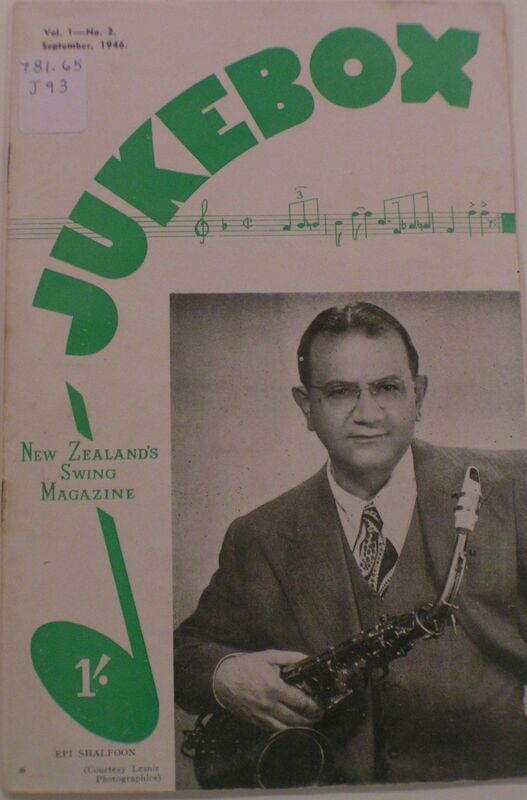 Maybe it’s the way my thought processes work, but it never once crossed my mind that there wouldn’t be jazz in New Zealand in the early part of the twentieth century. 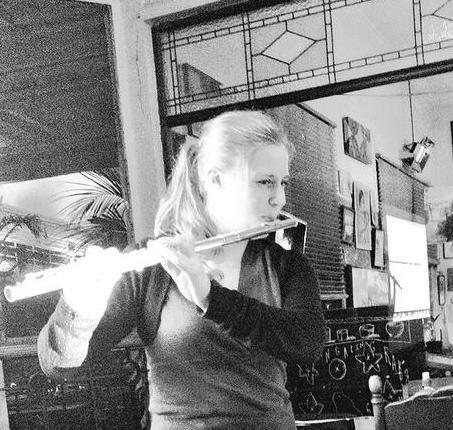 Deciding to research New Zealand jazz was an easy choice, as it followed on from research I began during my B.Mus in jazz performance (I play the flute). I’d been talking with my mentor, saxophonist Bernie Allen, about a stage three research paper topic. He suggested ‘the influence of the American troops bands in New Zealand during World War Two’. (As an aside, the second most common reaction I get is: ‘Wait. There were American troops in New Zealand? In World War Two?’). It was the proverbial light-bulb-over-the-head moment and it is what started me on this path. This was a fantastic project. I got to winnow my way through history books (Caroline and I must have checked out many of the same books! ); interview fascinating people such as trombonist Dale Alderton, one of the foremost bandleaders of the period; and delve into archival material. It was so much fun—and I got a good mark for it too—that it clinched my decision to become a jazz historian. Fast-forward four years, I’d completed my Masters degree (Rutgers University, New Jersey) and come home to do my PhD. My initial idea was to try and cover the history of New Zealand jazz to the present day. Fortunately my main supervisor, Greg Booth, talked me out of that. 100,000 words sounds like a lot, but it doesn’t go as far as you think. We whittled the period down to the 1960s and agreed to find a proper end point later down the track—which turned out to be about six months before submission. Now came the fun part: research. I’m one of those people who actually likes sitting in front of a microtext machine peering at badly-photographed newspapers (headaches not withstanding!). And it’s a good thing, too, because that’s what I did for at least two thirds of my research time as this was before Papers Past). I would scan through newspapers and magazines looking for adverts and notes in jazz columns, all the while trying not to get sidetracked by the thousands of fascinating unrelated things I stumbled across. Most surprising was that it wasn’t the music columns, or even the entertainment columns, that were the most use, but the women’s columns—because they covered social events, and many of these hosted jazz bands (especially in the 1920s to 1940s). The women’s columnists would, by default, mention things about the bands, the musicians, and their repertoire. These days, women’s columns and adverts are first things I look for. 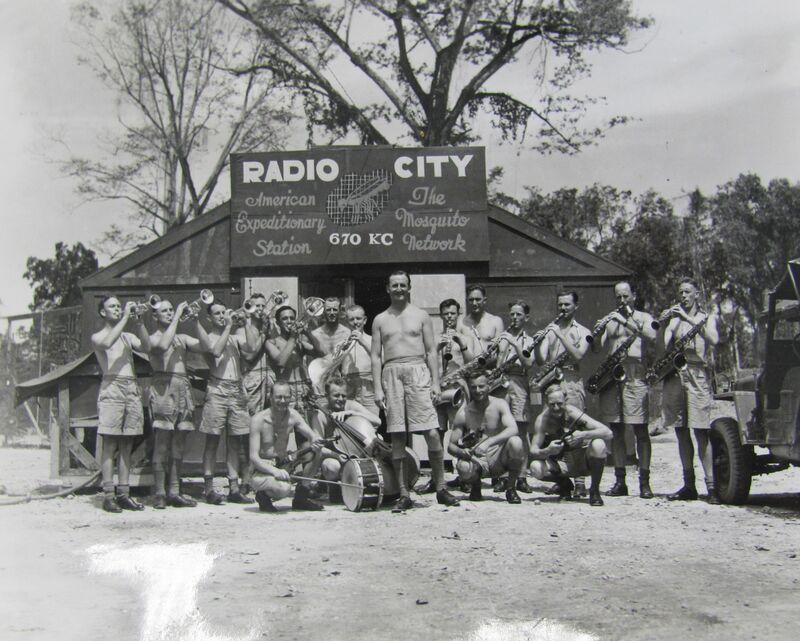 The RNZAF Swing Wing band in the Pacific circa 1944 led by Theo Walters (centre). From the RNZAF band papers at Archives New Zealand. Once I’d done a year of background research and the ‘lit’ review, I began the archival research and interviews. This was an incredible period, full of ups and downs and challenges—not least due to the untimely renovation of the National Library in Wellington, and the Christchurch earthquakes. My main port of call was the Alexander Turnbull Library in Wellington because they had the Dennis Huggard Jazz Archive (DHJA). Dennis is an Auckland collector who has been collecting historical material and recordings since the late 1940s. (Editor’s note: green with envy!). I spent months going through box after box of notes and cuttings on everything from musicians to venues (including trans-Tasman and trans-Pacific ships), concerts, radio, international tours and more. I also looked at other related collections, both at the Turnbull and Archives New Zealand, and local archival collections in Auckland, Wellington, Christchurch, and Dunedin. Unfortunately I’d only made one short trip to Christchurch before the first quake. The September 2010 quake came as a shock to me—literally. I was in Wellington at the time and woken up by thunderous shaking. It was the most terrifying quake I’ve lived through—completely disorienting. It seemed to go on forever. I couldn’t believe the epicentre was in Christchurch. If it was this bad in Wellington…(shudder). The quake meant the end of any on-site research, as some of the archives and collections were then closed. And then when the February quakes happened, everything was damaged and closed and, in a couple of cases, under water and sediment. While I was able to continue a small amount of research through microfilms and archives (like the DHJA) the quakes reshaped my research. I included Christchurch as much as I could, but inaccessibility to local historians, archivists and librarians meant there was a limit to what I could find out. The most fun part of my research journey was interviewing. I began with a list of questions that would satisfy the Ethics Committee (an Auckland University requirement) but, I have to say, I never used it because all I had to do was ask, ‘so, how did you get into jazz?’ and they’d be off. Often, in a two-hour interview, the only pauses would be when my subject had to find a particular photograph or item of ephemera they wanted to share. I remember once, during an interview that had started at three o’clock, my subject’s wife began to hover in the background because it was time to put the dinner on! One wife became worried that her husband was ‘nattering my ear off’ and ‘would I like a cup of tea?’ It was amazing how much these men wanted their story to be told, and this was after Chris Bourke had been around interviewing them for his book Blue Smoke. Sadly, I was unable to interview any women jazz musicians from the period as they had either passed away or were not well enough to speak with me. This was a great shame because, proportionally, New Zealand had more active female jazz musicians than many other countries, and I’d wanted to be able to represent that. Researching teaches you a lot of things—and not just around your subject. No one could have predicted those earthquakes. And I couldn’t have predicted how they would reshape my research. On the other side, I’m so happy to have met the older musicians and hear their stories and to build a picture of the entertainment scenes in the 1930s, 1940s, and 1950s—one that had not been told at all until Chris’s book was published. I feel privileged to be able to share these stories because they deserve, and need, to be told. It gives New Zealanders the opportunity to remember that the first half of the twentieth century was not all doom and gloom and social welfare—it was, at times, risqué, salacious, saucy, and fun.